And what happens when things go wrong? 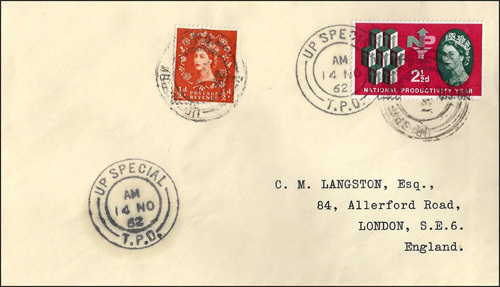 We will first describe what the AM postmarks of TPOs were and why they were introduced, then we will catalogue some of the AM postmark errors which have occured over the years. What is an AM Postmark? A TPO AM postmark simply looks like any ordinary TPO postmark, except that the letters AM (without any dots) have been inserted at the top. The every-day usage of A.M. is an abreviation of the latin Ante Meridiem (meaning before noon). However, the AM in a TPO postmark means after midnight. Although TPOs and their postmarks have been around since the 1838, we must jump forward to the year 1953 for the introduction of AM postmarks. Why were AM Postmarks introduced on TPOs? In the normal way of things, a FDC with new-issue stamps would receive a dated cancellation showing the official issue date of the stamp(s). For many years it was as simple as that. But some enthusiastic (fanatical?) collectors found a way of acquiring first day covers which were cancelled with the date of the day before the issue date! In what follows we must remember that only letters posted directly into the TPO’s letter box received a TPO cancellation/postmark. 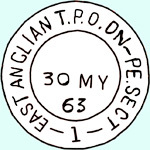 Moreover, the date on the TPO operational hand-stamp was always set to the date on which the TPO started its run and kept at that date throughout the run, even if the run continued past midnight and into the next day. Thus, if the TPO’s journey started in the evening of day 1 but continued past midnight into day 2, any mails posted directly into the TPO after midnight would still receive a cancellation date of day 1. Certain Post Office premises were open for business at midnight. You could purchase new stamp issues at midnight (at the start of the day of issue) from the King Edward Building in London or the Trafalgar Square Post Office (open 24 hours a day). Also, it was sometimes possible for stamp dealers to acquire stocks of new-issue stamps before the date of issue. Our enthusuastic collectors realised that – if you bought some new-issue stamps at midnight at the start of the day of issue … and if you had a fast car … you could put the new-issue stamps on your FDC, zoom off down the road at high speed to a post-midnight stopping point of a TPO, and post your FDCs directly into the TPO in the small hours of the morning on the day of issue. These FDCs would then get a cancellation dated the day the TPO run started – the day before the official issue date of the stamps! 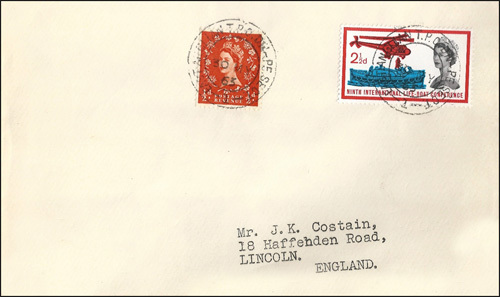 Of course, such covers became ‘must have’ items for TPO postmark collectors. Would the Post Office would care about this. They certainly did … in fact, they strongly objected to it. But their eventual solution to this ‘problem’ was to be enthusiastically received by collectors. The first thing the Post Office considered was to get TPO staff to change the date of theoperational hand-stamps at midnight (from day 1 to day 2) for all letters stamped after midnight. This was abandoned because they thought there was too much scope for confusion in the record keeping which went with TPO mails. The eventual solution was to create a special AM handstamp for each TPO where it was thought possible to ‘cheat’ the date system. These AM handstamps were stored at the TPO Section in London. When a new set of stamps was to be released, the AM handstamps were sent out to the appropriate TPOs for use only on the issue date, and only on the new-issue stamps. The next day, the AM handstamps had to be returned to TPO Section in London. TPOs continued to use their regular operational handstamps for everything except new-issue stamps, with the AM handstamps being used only on new issue stamps. But, of course, it didn’t always work out like that. Occasionally, the AM handstamp was used on stamps which were not ‘new issue’, and sometimes the normal hand-stamp (without the AM slug, and with an earlier date) was used on new issue stamps. All of which created new varieties for collectors to collect! By and large, the system worked well, but things occasionally went wrong. Post Office staff are only human, after all, and people do make mistakes. We will list below in date order a wide variety of cases where something did not go as planned, and what steps were take to address the problems. 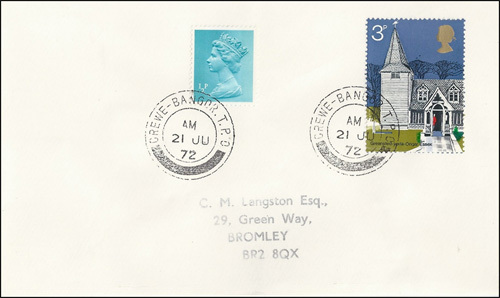 The Post Office Savings Bank Centenary stamp was issued on 28 August 1961. The FDC was posted into the Up Special TPO in the small hours of the morning of 28 August. Unfortunately, it was initially erroneously cancelled with the normal operational datestamp, dated on the date of departure of the TPO (i.e. 27 AU), instead of 28 AU using the AM handstamp. This stamp was issued on 14 November 1962. 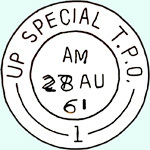 For reasons unknown, the Up Special TPO didn’t have its AM handstamp on board. In the absence of the correct handstamp the stamps were cancelled with a deliberately smudged operational datestamp (with the smudged date 13 NO and no AM mark). Collectors complained to TPO Section about the poor quality of the postmarks. 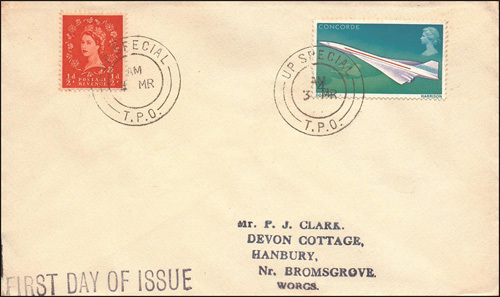 TPO Section took back the FDCs and applied the correct AM handstamp (dated 14 NO) clearly alongside the smudged ones. This stamp was issued on 31 May 1963. Some FDCs on the East Anglian Down (Peterborough Sect.) 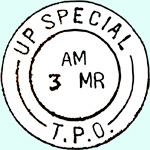 TPO were stamped in error with the normal Side 1 date stamp, and received the cancellation date of 30 MY (and no AM mark). 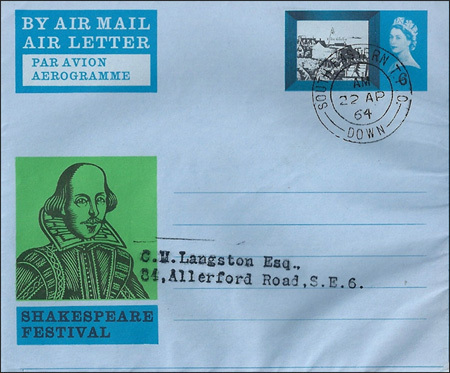 This aerogramme (with pre-printed stamp) was issued on 23 April 1964. The FDC was posted into the South Eastern Down TPO and erroneously cancelled with the normal operational TPO handstamp (thereby receiving a 22 AP cancellation date, that being the date when the TPO started its run). 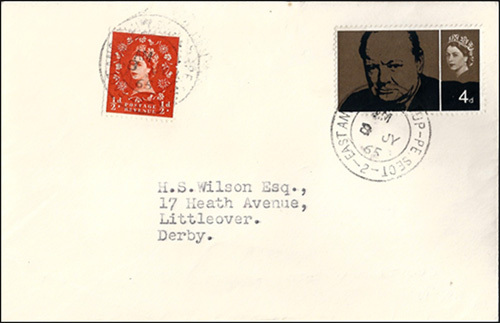 This Winston Churchill stamp was issued on 8 July 1965. 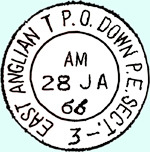 The FDC was posted into the East Anglian Up (Peterborough Section) in the small hours of the morning of on 8 July 1965, but was erroneously cancelled with the normal operational handstamp (thereby receiving a 7 JY cancellation date, that being the date when the TPO started its run). This was subsequently doctored by applying a numeral 8 over the original 7 in the date, and applying the AM slug in a separate operation (the AM is in a slightly different position relative to the 8 in each cancellation). 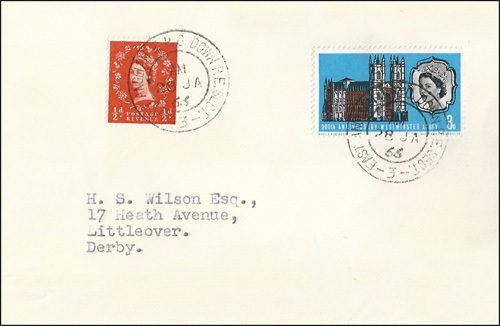 The Westminster Abbey Anniversary stamps were issued on 28 February 1966. The FDCs on the East Anglian Down (Peterborough Sect.) TPO correctly received the AM handstamp, but this handstamp was erroneously dated one month earlier (28 JA). The previous usage of the East Anglian Down (Peterborough Sect.) 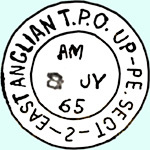 TPO AM handstamp would have been for the Robert Burns new issue (on 25 January 1966, or 25 JA). The most likely explanation for the error here is that, when updating this AM handstamp, TPO Section changed the day from 25 to 28 but forgot to change the month, giving a date of 28 JA. When preparing the Up Special TPO AM handstamp for the First Flight of Concorde issue, TPO Section got the day and month right (3 MR), but somehow omitted the year slug below the date. 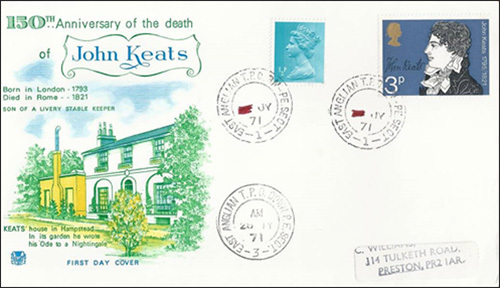 The Literary Anniversaries stamps were issued on 28 July 1971. This FDC was posted into the East Anglian Down (PE Sect.) TPO in the small hours of the morning of 28 July, and erroneously cancelled with the normal operational TPO handstamp (thereby receiving a 27 JY cancellation date, that being the date when the TPO started its run). 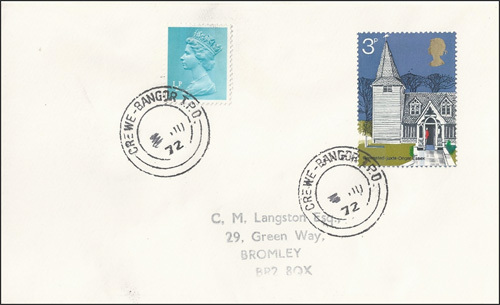 The British Architecture stamps were issued on 21 June 1972. This FDC was posted into the Crewe Bangor TPO in the small hours of the morning of 21 June 1972, but was erroneously cancelled with the normal operational handstamp (thereby receiving a 20 JU cancellation date, that being the date when the TPO started its run). Upon realising the mistake, the TPO staff deleted the date 20 on both the 3p new-issue stamp and the ½p ‘late fee’ stamp with a biro. 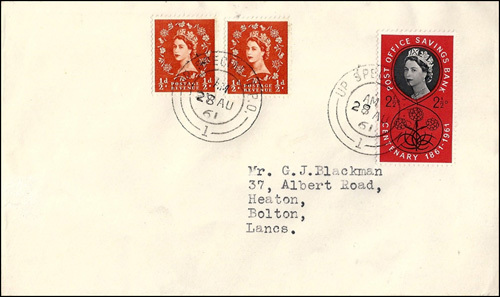 They then sent the remaining (uncancelled) covers to TPO Section in London, where a datestamp was applied to them with the correct date and an AM slug. 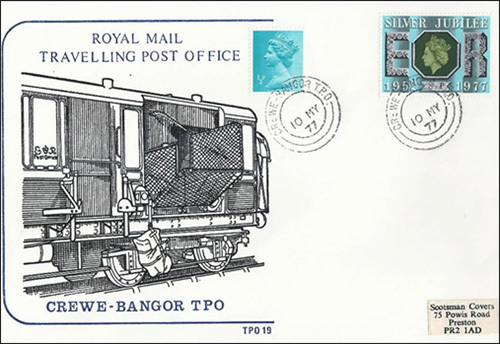 A similar situation occurred on the Crewe Bangor TPO both 13 September and 18 October of the same year, when the Broadcasting Anniversaries and Christmas stamps respectively were issued. 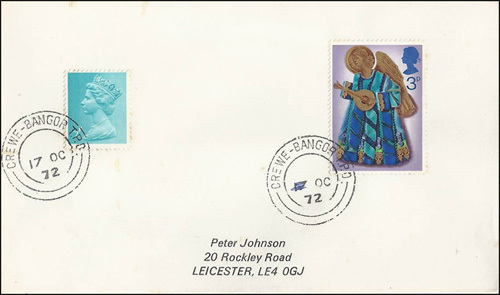 However, on both of these occasions only the new issue stamp had the date obliterated by biro. 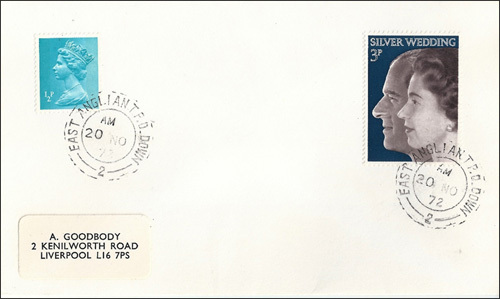 The Silver Wedding stamps were issued on 20 November 1972. This FDC was posted into the East Anglian Down TPO in the small hours of the morning of 20 November, and erroneously cancelled with the normal operational TPO handstamp (thereby receiving a 19 NO cancellation date, that being the date when the TPO started its run). When the mistake was noticed the numeral 19 was erased and the numeral 20 substituted by applying the appropriate slug by hand on top of the erased figure. The new 20 is clearly more heavily printed than the previously printed month (NO). There is not much left to see of the previously printed (and erased) 19, though it is slightly more visible in the right hand cancel. The AM slug was applied separately above the date, again by hand (note the different positions of the AM). Only 12 covers are thought to exist. The Silver Jubilee stamps were issued on 11 May 1977. This FDC was posted into the Crewe Bangor TPO in the small hours of the morning of 11 May 1977, but was erroneously cancelled with the normal operational handstamp (thereby receiving a 10 MY cancellation date, that being the date when the TPO started its run). In this case, the error simply wasn’t noticed. You might wonder why the Post Office went to all this bother. But the Post Office took things very seriously!